Attempting to bring back the Sander-Hansen name and giving credit to Sander-Hansen's Replacement in the market - Barry-Wehmiller. Krones has recently unveiled it's new design of pasteurizer; First the Sander-Hansen Channel, Krones - Shark, now the Sander Hansen Shield. 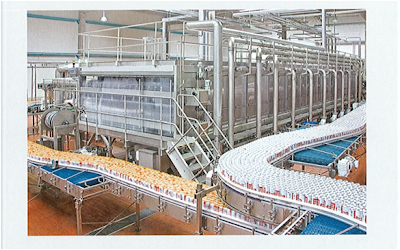 The Deck Heights are still much higher than required which in many cases costs additional dollars in conveyor and conveyor control to get into and out of the pasteurizer. The marathon belt is still to be proven in the long run, and the machines control is still in a costly PC based based system that requires factory intervention to modify. The machine is a step in the right direction following the Shark pasteurizer and Sander-Hansen Channel Pasteurizer, both machines were arguably light-weighted to the point where many customers complained of machine life issues. While still not as cutting edge as the competition, the machine is a sign that Krones is responding to the loss of many major North American Brewery customers. Pro Engineering and Manufacturing really helped bring these machines up to speed. After they refurbished our existing SH & Barry Wehmiller machines we were experiencing drastic energy savings and less maintenance. I would strongly recommend looking into these guys if you are looking for the most cutting edge pasteurizing solutions. I wish to inquire on one certain pasteurizer I came across, Year of Man. 1996, Type: PD-4WT-333-27, it does not have a cooling tower its used to pasteurize bottled beer. Would it be by design such that a cooling tower was not incorporated or it might have the customers request not to have a cooling tower in place?